I laughed to myself recently when I read that a blogger got rid of her barstools with backs because her kids were big enough now that they no longer needed the backs on the stools. I have exactly the opposite situation in my house: my family members are so big that they DO need the backs on the stools! For perspective, you should know that the shortest fellow in this photo is 5'9", which is the average height for an American male. You can see for yourself how "average height" looks in my family. Anyway, for people this big, a low-profile barstool with no back is just not comfortable. And I want my kitchen to be a comfortable place in every way. I found plain Jane barstools at TJMaxx several years ago. The seats were covered with a flimsy canvas, but I immediately re-covered those with an upholstery-weight fabric and all was well. 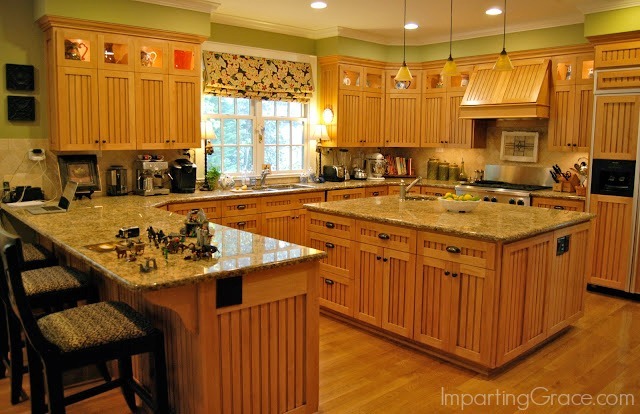 Here's how my kitchen looked back in 2009. Then I decided to emphasize the black in the granite of my kitchen. I made a faux Roman shade with a black-background fabric, and I transformed the barstools with some spray paint and fabric. This spring I've decided to embrace a lighter, brighter look in my kitchen. I'm planning to do a full reveal of my "new" kitchen next week, and I'm looking forward to sharing all the details with you. One of the first things I knew I needed to change was the barstools. I loved the black, but that wasn't a light, bright look. After I painted the walls and transformed my kitchen island, I decided that my faux Roman shade made from a tablecloth worked well in the new space. But what fabric to use on the barstools? 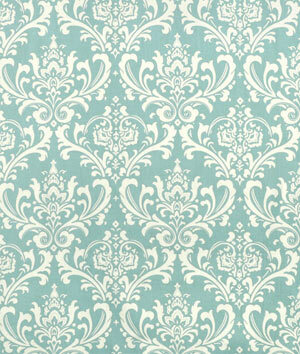 After lots of searching, I found the answer at Online Fabric Store: a Premier Prints fabric called "Ozbourne Village." The best part? It cost me only $7.45 per yard! Mind you, it's not an upholstery weight fabric, but so far it's holding up just fine. I sprayed the seats liberally with Scotch Guard before installing them. I'm so pleased with how they turned out! If you've never recovered a chair or stool, I encourage you to try it. It's the simplest form of re-upholstering. 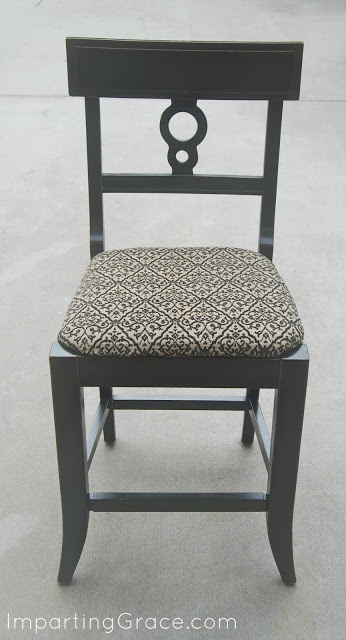 All you do is flip the piece upside down, unscrew the seat, use a staple gun to attach a new piece of fabric right over the old fabric, and screw the finished seat back in place. Really, the only tricky parts of this kind of job are pulling the fabric really taut and easing your way around the corners. Anyone with a staple gun can do it! Why distress them? Well, I like the look of distressed furniture, to start with. But more than that, I know that these stools will get a lot of use. The painted finish is bound to get nicked and scratched. 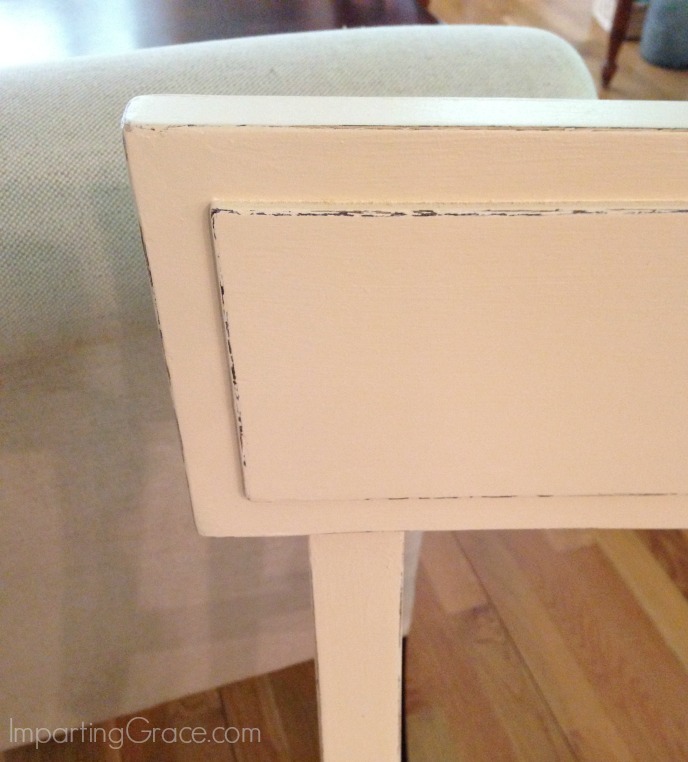 With a distressed finish, nicks and scratches just add to the charm! And since they're still just as sturdy as they were the day I purchased them, the current look may not be their last! What do you think of their latest iteration? 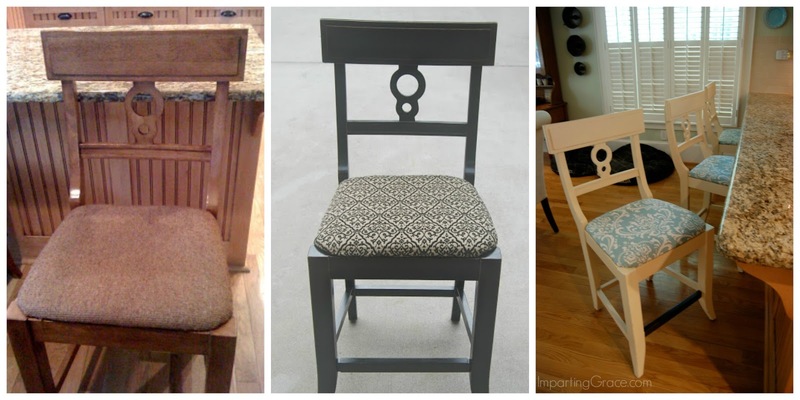 Does your furniture evolve over time? Beautiful job on the bar stools! They look great and your kitchen is so pretty!!! 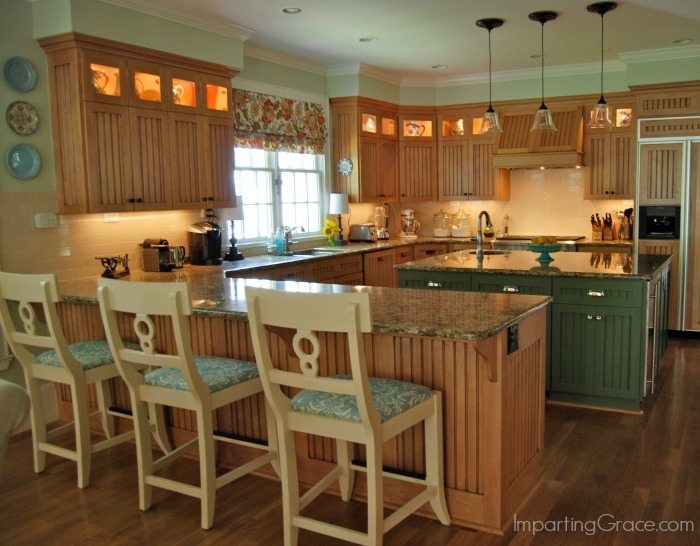 I just love the new colors in your kitchen! The bar stools look wonderful. I don't blame you one bit for keeping them and revamping them. The fabric is so pretty. Laughing at the heights at your house. The tallest here in ours in 5'8"...we are the opposite end of the spectrum. 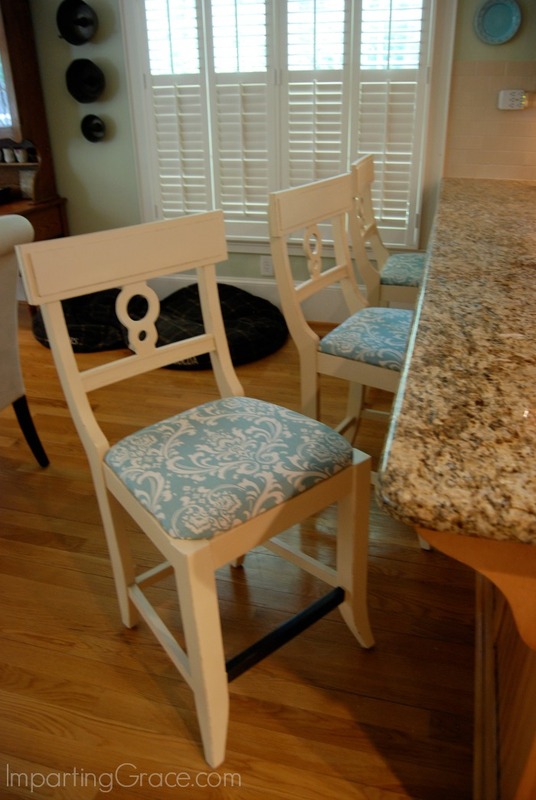 Richella, your barstools look great! I think I have recovered my dining room chairs about five times. Love the paint color and the distressing! Beautiful job on those stools! Oh yes plenty of my pieces have had many different looks!! I agree, back on my barstools...please! I love the new color and material.. looks great! How do you keep things so neat with all thos big guys? Blessings! They look perfect in your kitchen! 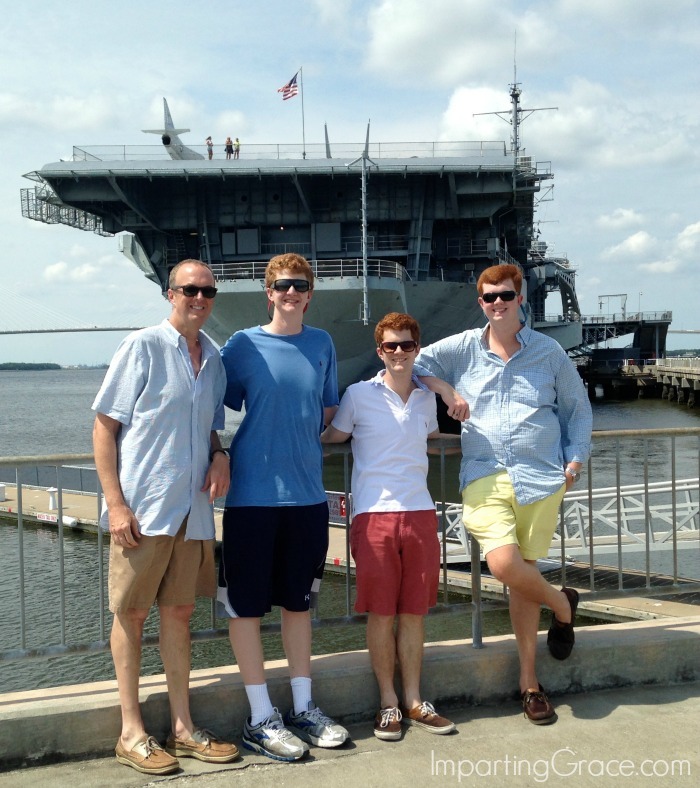 Your boys are like mine: my "runt" is 6'; I'm 5'9", so when I take a picture with them I look short! 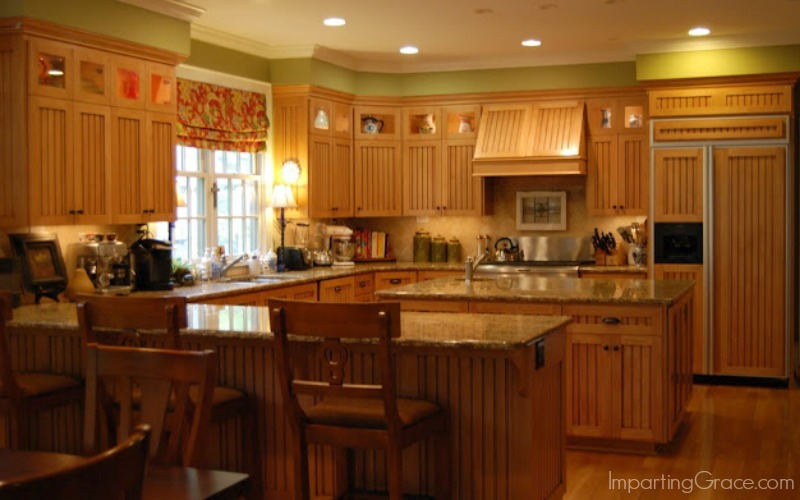 Your kitchen looks GREAT and the way you've redone your bar stools! Wonderful choice of fabric. I've been toying with redoing my mine also but I'll have to wait until we find our next home to see if I'll even be able to use them there.